I am so proud of you Andy! You have grown up nicely. Glad you are back in the USA doing your music. Perhaps, one day I will personally attended one of your Concerts. Please keep me inform. Ms. Glymph. 4 weeks 1 day ago. Andy Akiho is with Michael Joseph McQuilken and 2 others. Composer Andy Akiho, director Michael Joseph McQuilken, and 2016–2018 Ensemble Connect Fellows collaborated on this new music video for “Cobalt Canvas.” Andy Akiho said that “Cobalt Canvas was written with all 18 members of Ensemble Connect in mind, with each part specifically tailored to each individuals' personality. I'm extremely happy with the piece because it felt like a true collaboration." Cobalt Canvas was commissioned by Carnegie Hall and premiered by Ensemble Connect in June 2018. 1 month 16 hours ago. Andy Akiho is at Wallis Annenberg Center. “It was, indeed, riveting ...absolutely fresh....incandescent in its synergy between music and poetry...” - LA TIMES Check out the latest review in the Los Angeles Times for (M)iyamoto Is Black Enough at The Wallis in Beverly Hills, CA 🎵🎶 https://www.latimes.com/entertainment/arts/la-et-cm-miyamoto-black-enough-review-20190315-story.html 1 month 4 days ago. Come out to the final show in LA tonight for @MiyamotoIsBlackEnough @TheWallisBH ! 🌴 Tickets still available! 🎫 Promo code: SAWDUST 🤫 1 month 5 days ago. Andy Akiho updated their cover photo. 1 year 3 months ago. 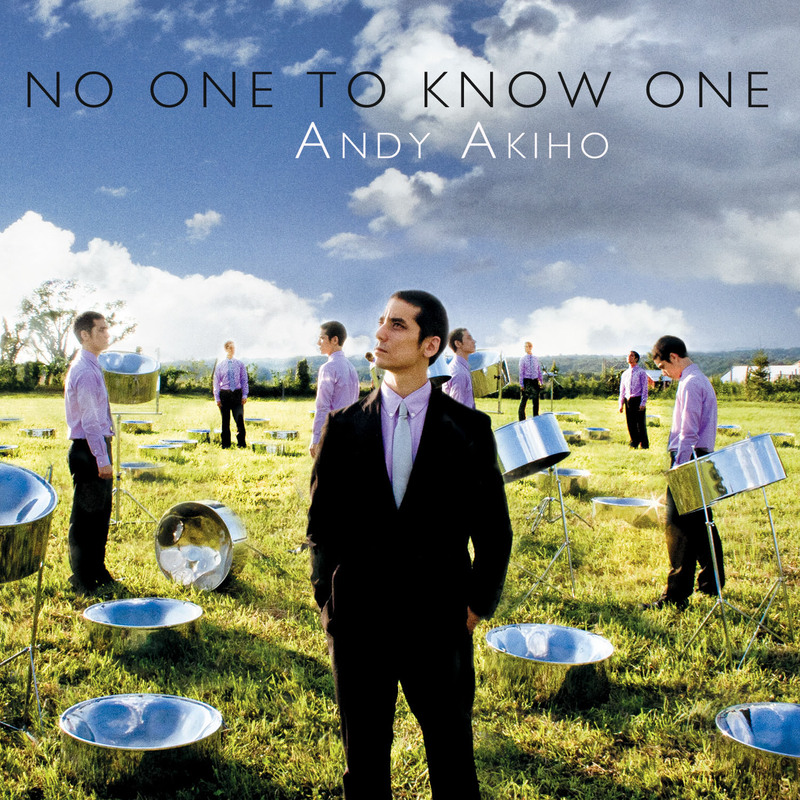 Composer and steel pan virtuoso Andy Akiho, whose work has been called “mold-breaking” by the New York Times, presents NO ONE TO KNOW ONE, his first disc of seductive, tuneful, and genre-bending compositions. Akiho’s music has been featured in a wide variety of venues such as le Poisson Rouge, Jazz at Lincoln Center, Merkin Hall, Mass MOCA, The Tank, John Zorn’s The Stone, and the St. James Theater in Port of Spain, Trinidad. In addition, he has presented his compositions in festivals ranging from the Bang on a Can Marathon, to the Norfolk Chamber Music Festival, to the world’s premier steel pan event, Panorama. Indeed, Akiho has been touted in the New Haven Register as, “the composer/performer who drives pan music to new dimensions.” Drawing inspiration from his father’s Japanese heritage, his childhood in South Carolina, his intensive steel pan studies in Trinidad, his graduate studies at Yale, and his deep involvement in the New York new music scene, Akiho is not easy to pigeonhole. In NO ONE TO KNOW ONE, it is clear that Akiho and his multi-faceted ensemble are serious about crashing through stylistic barriers in the service of cutting-edge art. Willie Ruff, the Director of the Duke Ellington Fellowship at Yale, and no stranger to landmark recordings (his performing credits include Miles Ahead and Songs of Leonard Cohen), has said, “These young musicians are creating some of the most exciting and original music I’ve heard in a long time. I think we’re seeing history being made by these composer-performers.” That much is apparent from the outset of this disc, as the offbeat groove of “Hadairo” launches the set with ominous harmonies and fresh timbres, highlighted by the kaleidoscopic violin improvisations of Domenic Salerni. For the funky waltz tune “Kiiro,” Akiho expands his ensemble of steel pan, strings, harp, and drums to include woodwinds, piano, and keyboard percussion, creating a massive sound that is as enrapturing as it is unique. Akiho scales back the group on the next few tracks, allowing the revelatory sound of his steel pan to take center stage. “Murasaki” is a wistful reggae-influenced ballad that features Maura Valenti on harp, while the ferocious cello playing of Mariel Roberts and the rhythm section of Sam Adams on bass and Kenneth Salters come to the fore on the driving “Aka.” “Karakurenai” explores the timbral possibilities of a prepared steel pan, while “Daidai Iro” contains perhaps the sunniest melody on a disc full of great tunes. At this point, NO ONE TO KNOW ONE takes a turn into much darker territory. “to wALk Or ruN in wEst harlem” evokes the suspense of a harrowing personal experience Akiho had walking home late one night. One can literally hear the footsteps falling faster as the piece rolls on. “the rAy’s end” makes use of an unexpected ensemble—trumpet, violin, and steel pan—to virtuosic effect. The title track “NO one To kNOW one” was described by the Denver Post as “immediately appealing” and “action-packed,” filled with “alluring, exotic sound colors, which were in turn complemented and energized by layers of insistent, percussive rhythms.” Here, singer Fay Wang gives the text (by Akiho himself) a reading that is both sultry and otherworldly. Finally, in “21,” Akiho duets with Mariel Roberts in a work that beguiles and confounds as it wends its way through myriad textures and sonic worlds. Performers include: Andy Akiho, Samuel Adams, Kenneth Salters, Mariel Roberts, Domenic Salerni, Maura Valenti, Nicole Camacho, Alexandra Detyniecki, Inhyung Hwang, Sarah Kuchta, Ian Rosenbaum, John Corkill, Tiffany Kuo, Suresh Singaratnam, Raul Garcia, Ruby Chen, Fay Wang, Candy Chiu. "La musica di Andy Akiho si nutre degli opposti. Essa ha chiare origini nel folk – lo strumento suonato dal compositore/performer Akiho, lo steel pan (strumento a percussione ottenuto da bidoni metallici) è originario di Trinidad e Tobago e ad esso sono dedicati interi festival celebrativi della cultura caraibica (i quali si svolgono ogni anno a Brooklyn) –; ma possiede il rigore formale proprio della tradizione colta. Essa ha una forte componente ritmica – intriganti patterns ritmici sono eseguiti con incedere minimalista, cui si aggiunge una vis combinatoria che talvolta genera complessi giochi di incastri –; eppure non rinuncia all’elaborazione di suadenti linee melodiche. Essa è innovativa – nel mescolare stili e suoni (lo steel pan, a sua volta spesso sottoposto a manipolazioni di vario genere, è affiancato ora da basso e batteria jazz, ora da un vero e proprio ensemble cameristico comprensivo di flauto, clarinetto, violino, violoncello, tromba) –; ma suona familiare all’orecchio di chi è avvezzo alle tendenze più contaminate della ricerca musicale (soprattutto di marca post-minimalista) contemporanea. L’abilità maggiore di Akiho è di far convivere tutto ciò in un flusso sonoro fluido, trascinante, coeso, fresco, positivo."